- Remove all fake players, teams. - Leagues: Premier League, Ligue 1, Eredivise, Serie A, La Liga, Liga Zon Sarges, Bundesliga, Brasileirão. - New teams: all clubs in final match of UEFA Champions League (2008 to 2012), Euro All Stars, America All Stars, Africa All Stars, Asia All Stars. - Add full kits for all teams. - Add more 2600 faces with many great faces. - New boots and relinked for almost playes: adidas F50 adiZero III Bladidas F50 adiZero III Messi White/ Black/ Red, adidas Predator Lck/White/Green, adidas F50 adiZero III, Yellow/Black/Green, aZ Black/ Pop/ White, adidas Predator LZ White/ Yellow/ Blue, adidas adiPure 11Pro White/ Red/ Black, adidas adiPure 11Pro Black/ Yellow/ White, Nike GS 2 White/ Black, Nike Mercurial Vapor VIII ACC CR7 Black/ Blue/ Pink, Puma King Finale SL FG Yellow/ Black/ White , Puma Evo-Speed Green/ Blue/ Yellow, Puma PowerCat 1.12 Graphic Cesc Fabregas Yellow/Red , Puma PowerCat 1.12 SL Black/ Green/ Blue, Lotto Zhero Gravity II Risk Red/ White Warrior Skeamer Blue Radiance and more..
Credit: Jenkey1002 & Juce (kitserver), Pesedit (some model kits), Odil24, Nilton1248, Yevan, wens, vogin, hak912000, johnnyusa2k3, KO, vietanhtlk, foxbarcelona, Ilhan, Txak, radeqq81 & 1002MB, Teiker17, Elboss, tbvsac, Cevat_12, Ercan Ayan, DracheN, El Yorugua…. - When you click star button if you select 1.01, the patch will have many faces, full kits and only play offline. If you select 1.03, the patch will haven’t many faces and kits, but you can play Online and Offline with patch. 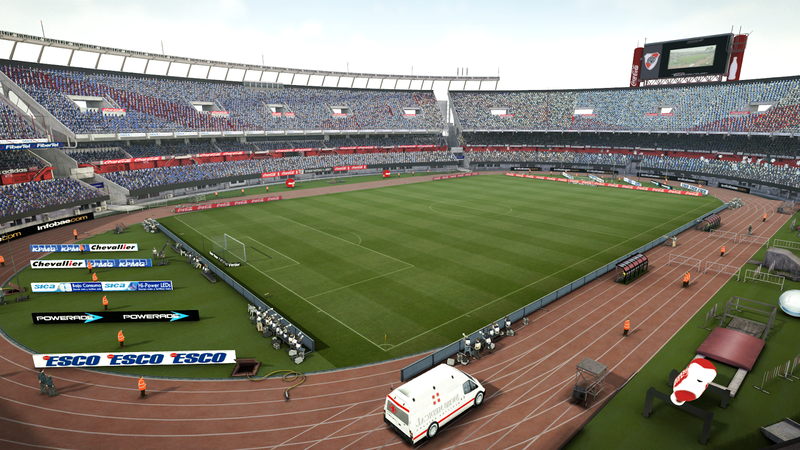 Stadiums Pack 2013 for Selector - Released !!! Credits: ema1993, Yucel11, S@kR, cui_ruby, Gkan, oliver14 and All stadiums maker. - Update some winter transfer. - Select Offline Mode and ML Mode in Switches - Ultilites tab before play ML or BAL with patch 1.03. Select Online Mode to play online. Da, najkraće rečeno - ako se prebaciš u 1.03 mod, patch otpili kitserver. Zato i piše gore da u 1.03 modu neće biti dostupno puno faca i dresova, ali da radi online (i offline, ali opet, bez dosta faca i dresova). eh sad jedno pitanje.. npr. da krenem s tim 1.03 Patchom u kojem bi u ML svi igraci imali 'normalne' kopacke (jer mi je samo zbog toga bitan taj patch ) bili mi te kopacke ostalo kad bih opet vratio na 1.00 ili 1.01 verziju i nastavio tu ML? - Remove all fake players & teams. - Add more 3000 faces with many great faces. - Select Offline Mode and ML Mode in Switches - Ultilites tab before play ML or BAL, select Online Mode to play online. - All new teams are in Other Euro Teams League after you select Exhibitions Mode in Switches - Ultilites tab of Fire Patch tool. Dražene, kakav je patch? Ima li bugova? Tvoj dojam? jel ima mozda neko torrent ili jedinstveni link za ovaj patch?